my roommate has been diagnosed with the swine flu! yes, she wears a mask, but no she is still not considerate of our health and lays all over the couches leaving her dirty thermometer in between the cushions. we disinfect every night after she's in bed and all praying we don't get sick while in school. 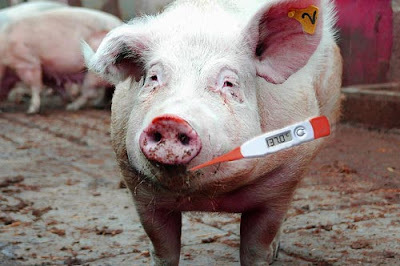 and yes i photoshopped this thermometer into the swine's mouth thus showing the swine flu. that totally stinks! dont bring it home...if you do mom will make you strip down on the porch just like Chris had to when he came home from work. lol good luck with all of that!